The temptation to try a Snap Test on a flat Chip proved too good to resist. The Chip won. It broke perfectly in half, just like a crumb free cracker. It had a similar crunch to a cracker as well. Firm and robust, but a mouthful quickly turned to mush. 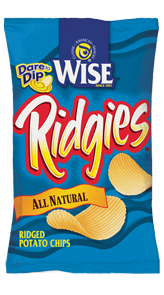 These Ridged Chips had a strange texture to them. The Ripples were narrow - very narrow in fact. The Chips were also mostly flat. As in pan flat. Most Dip geared Chips usually have curves and bends for scooping up the dip, these did not. There was browning and skin on edges, plus some visible seasoning, but these looked different. We like different. Regular readers of reviews at Chips & Crisps, will be aware that we are not the best judges of Natural, Original, Regular or whatever else Chips companies call their flavor-free Chips. These tasted a little oily potato to our uncultured palates. The crunch improved them, but without an additional flavor to add to potato and salt, they seemed little more than a sandwich sidekick to us.